Looking northeast over the ridge from Nyankunde mountain. It was more than four months later when I saw John again. He left the forest camps to find me on the far eastern savanna where Peace Corps posted me as a secondary school science and English teacher. He followed the single road along the edge of the forest to where it turned abruptly east, continuing as though tracing a contour line on the grass-covered ridge above the swathe of gallery forests that clothed the Shari River valley. He road atop a truck through the tall Themeda-grass savanna, it seemed empty of people compared to the farmed hills around Bukavu. John passed herds of reddish long-horned Hema cattle, and here and there a grass-dome Hema home with spotless swept clay yard. He climbed off the truck where a single track left the main road. He started to hike, pack on his back, when a missionary pick-up stopped in its cloud of dust. 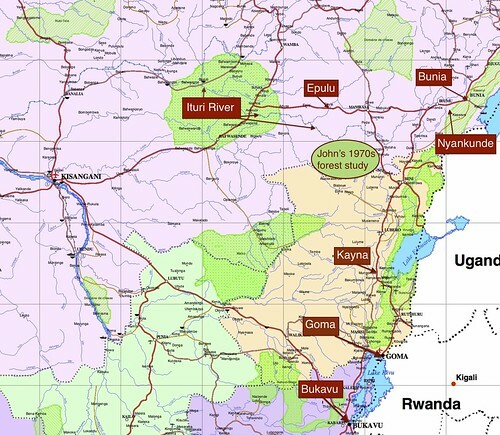 “Going to Nyankunde?” The missionary hospital/village was just 15 km further on. I was the first Peace Corps volunteer at Nyankunde. The missionaries assumed I would take a spare room in one of the mission houses, but I was adamant. To learn Swahili I was certain I had to live amidst Swahili speakers. Shadrach Kahiigwa, the church’s legal representative, was amused as much by my insistence as by the elder missionaries’ consternation but offered a solution. I moved into his family home. Some of the older missionaries did not approve, but they said only that I would not get proper breakfasts. I agreed to breakfast three times a week with Bwana Nelson. My broken Swahili was subject to a concerted communal improvement campaign in the kitchen of Kahiigwa’s wife, Hannah, where I also pounded peanuts into peanut butter, manioc leaves into sombe, and mihogo (starch tubers) into flour. My nervous American skinniness was nourished by the full pastoral Hema diet: beans in butter, beef in butter, and sombe cooked smooth in palm oil. I taught in French at the secondary school wearing long skirts of African cloth, and I spoke French at the table with Kahiigwa. The mission had sent Kahiigwa for two years of training in Switzerland. With European skepticism, he now observed his own society and particularly the burgeoning political cult of President Mobutu, the “Guide”. He was less optimistic than my Peace Corps trainer, Paluku. Schools were nationalized, students performed mandatory cult dances and songs before classes, rival political parties were banned. Mobutu’s portrait hung everywhere looking down with a self-interested benevolence that could excuse all manner of ruthlessness. Although embarrassed, Kahiigwa did not object to the false veneration: no one wanted a repeat of the 1960s’ rebellion with its chaos and spilled blood. The rebellion had gutted his natal village. Two of his uncles had been killed. No matter how false this leader-worship, it was better than war. In the rebellion there had been no winners, only losers. In the end, he predicted with unconscious prescience, even Mobutu would be a loser. Breakfast with Bwana Nelson, just two houses away, was in another world, a pre-rebellion world. The day started with scripture reading for the African “help” at 6:45 AM. I sat on the garden steps, next to the fellow who would cut Bwana Nelson’s grass with a scythe-like coup-coup. The woman who washed clothes and the cook sat on the upper steps; all of us bowed our heads. I tried to follow the formal Swahili Bwana Nelson intoned facing us from the stoop. Bwana and Mrs. Nelson would have preferred that I just slip around to the front door and enter as any of the white missionaries would have done, but that seemed to me a false representation of my spiritual status. Besides, I’d rather be listening to the Swahili prayers than chatting in English with Mrs. Nelson. At the table she rang a little bell to signal to the cook that we had finished a course: first papaya, then porridge, then toast with eggs. After the rebellion, Belgian administrators and plantation managers had not returned, but many of the old missionaries like the Nelsons had. I eventually realized that the discomfort they felt with the new Zaïrian institutions, which they did not trust, was no greater than their discomfort with the younger missionaries who wanted the young Zaïrian Christians to become independent, to run the hospital, the schools and even the mission. The Nelsons’ Congo had been different. Bwana Nelson, Bwana Dean and Bwana Speese, all three of them, remembered Colin Turnbull. But they remembered him in their own “old Congo” context. My letters told of learning Swahili, of my students and of a growing discomfort with what life brought to Zaïrian women. How could I be an example? None of my female students had my choices. There were only two girls in my senior class and one was an unwed mother. Three were in my sophomore class and one became pregnant by a fellow Zaïrian teacher only months after school started. Another, a freshman, quit school later when she became pregnant by another teacher. As my senior student told me, it was only by the favors they bestowed that the female students could get decent grades. Nyankunde was east of the Ituri Forest. Nyankunde was spread along the base of “my” mountain, insignificantly small from the summit. I saw the snow-capped Ruwenzori and the Mountains of the Moon to the south, the Blue Mountains to the east and northeast. But the dominant landscape was savanna. Down the hill along the east-lying ridge and off into a distant near flatness, the savanna ran a smooth green, darkening with dusk and dotted by cattle. The savanna green barely paused for the small dark squares planted to beans or sweet potatoes. As it moved toward the horizon all the little variations melted toward the darker forest that, spreading south and north, rode out to engulf first its rivers and then took in even the reddening sun. I shared my highland with the “king of the mountain”, the Augur buzzard. Below him from the tall savanna grasses came the swaggering flights of thick-billed bishops and extravagant-tailed whydahs. The bishops and cardinals, I called them, names for their ecclesiastical elegance and my quiet revolt against the personalized, protestant evangelism of Nyankunde. I observed the migration of giant dragonflies at the spring equinox, patrolling back and forth close to the lengthening grasses. Much later I watched the migration of vast flocks of Abdim’s storks, turning so high that at the top of their spiraling funnel they became tiny disappearing specks. They marked the approaching dry season and the approaching manyonyo grasshoppers. The first wave of the grasshopper “migration” was met by running, barefoot children. They came by the dozens, scaled the hillsides to the upland pastures, and pursued grasshoppers with riotous energy. Once caught, they strung the grasshoppers on grasses that were tied in hoops and sold as a prized addition to sombe. Some afternoons I joined the grasshopper hunt, but as shadows lengthened I cut off up the mountain. When John finally left the forest, towards the end of that December, it was to the mountain that we went together. As always with John, I wandered farther than ever before. Not content with the mountain, we followed the ridge east. We discovered a hillside gallery forest with Colobus monkeys. On a rocky promontory, as a hobby swooped past us again and again, we took up our discussions of four months earlier as though after an interruption of only an hour or two. 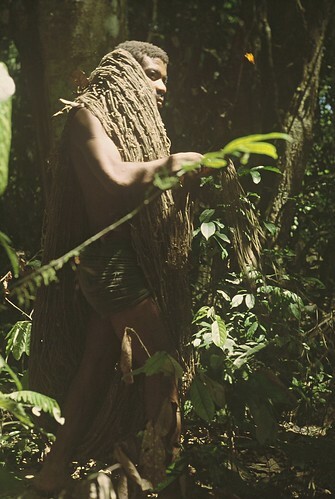 A central question for John was whether or not the Mbuti Pygmies really could live off the forest. Turnbull said that they could and they did in the central Ituri, but farther south John did not see it. Instead the Mbuti had long standing relationships with small-scale forest cultivators, the Bapakombe and the Bapere in the southern Ituri. These cultivators supplied the Mbuti with agricultural produce in exchange for forest products and labor. 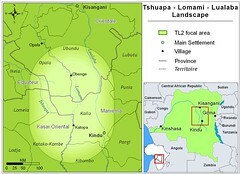 Now, as new ethnic groups were invading the eastern forest, the Mbuti were not retreating deeper into the forest. Instead they were hunting out the forest so as to exchange game meat for starch foods, cloth, and market trinkets. John and I sat talking, with binoculars trained on the bishops and a whole congregation of busy waxbills. Our discussions would begin in English on the mountain and continue in French with Kahiigwa at the dinner table and finally end up in a laughing Swahili discussion in the kitchen where we compared forest foods with savanna foods. “We left the Catholic mission of Mbingi at about 9 in the morning. Mbingi is 20 km from the main road. There are no villages, no farms, only tall montane forest and 20 km of rocks and ruts. We had two tire blowouts…both on my bike. Not only did the inner tubes have one-inch holes in them, but the tires also were torn and had to be mended. We lost time… Finally we reached the main road, but we had planned to stay at a little town called Kayna and at 5:30 we were still 30 km away and none of the few villages between had places to stay. We had just come down out of the bamboo zone, but the population was still sparse. We spotted a plantation house up on a hill and cattle grazing nearby. All colonial farms have been taken over since the Zaïrian rebellion; it was unlikely that we would find any managers there. But we decided to ask if there was a place where we could be put up. The house had been abandoned and looted two years earlier; now it was in ruin. The few servants and shepherds, who had been left to tend the cattle for the Zaïrian state, welcomed us, but they were living in unpaid disorder. It was clear that we should sleep under the stars. We went a ways down the hill and built ourselves a big fire. Curious villagers and a few plantation workers obligingly helped us gather wood. We were famished. That morning, at Mbingi mission, we had had a hearty breakfast, but we had not eaten a meal since then. We’d come to a hamlet that had set out honey in empty beer bottles and, afterwards, we had intermittent sips from the bottle that we bought. It tasted different than any honey I had had before. John said it tasted just like the smell of flowers in the mountain forest. In the quantities that we swallowed, it not only killed hunger, it made our blood race. As night fell, there we were by our fire, still energized by honey, and surrounded by curious men. As evening came on, one old man had his children bring us water. One after another the men left. One lingering shepherd asked if we ate bugali. ‘Sure’ we answered enthusiastically. He ran off and brought us back manioc paste and beans. They were cooked without salt, even that basic condiment was beyond the means of these mountain shepherds, but the beans were delicious. Then John and I were alone, under the milky-way, pushing the burned ends of wood deeper into the fire. ‘Why don’t we get married?’, John asked. We returned to Nyankunde lean, triumphant and on our third set of inner tubes. It was a homecoming. We pedaled east across the savanna toward the Nyankunde mountain with the village at its base and the mission on its flank. Kahiigwa’s house was the only African home amidst the missionary houses above the church. The Kahiigwa’s indulged us. They were pleased, very pleased that we were engaged. After all, they had put us up under the same roof despite the scrutinizing glare of the elder missionaries. They slaughtered a goat to make the engagement official. Hannah made plantains, mashed and cut with a thread into perfect patties. It was also John’s farewell dinner. After nearly three years on a one-year grant his money had run out. I still had my second Peace Corps year to teach in Nyankunde, but already we were busy planning what would come later. We would return to Zaïre of course, somehow. My second school year in Nyankunde, I spent weekends bicycling to far-flung missions and late afternoons up the mountain. I continued to speak Swahili in the kitchen, French in the schoolroom, and English at breakfast with the Nelsons. The year sped past. “I will be back,” I told Kahigwa, Hannah and their children. Back in Minnesota and together again, John and I moved into a small first floor apartment that was mainly the spacious kitchen of an old Minneapolis home. We lived on the edge of the University of Minnesota campus; part-time students, part-time laborers and plotting full-time our return to Congo. Sitting at the little table in the center of the drafty kitchen, we wrote up our critical list of things to learn before returning to Zaïre: midwifery, machine mechanics, first aid… We pinned it to the wall above the radio from whence it oversaw our lives: first unmarried and then married, eventually full-time students. The list came with us and was stuck on the wall of the minuscule cooking space in our garage apartment in Michigan where we were in graduate school. Suddenly, although unplanned, we were going to become parents, and the list moved with us to university family housing where it was thumb tacked with course schedules on the bulletin board by our desks. The list hung in its central position even as months turned to a year and then two years and our orientation became academic. I was studying Botany, concentrating on the dominant trees of the Ituri Forest, Gilbertiodendron, locally known as mbau. In the Congo overlaying the equator there were tall forests of mbau covering many square miles. John told me that in mbau forest he could stand in one place and every large tree he saw would be mbau. 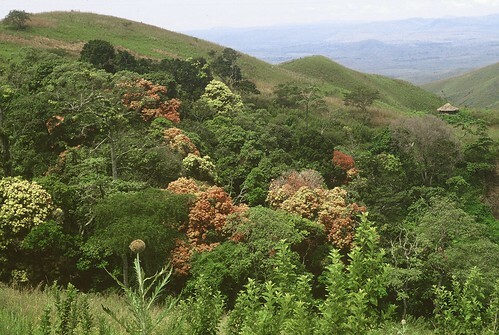 Tropical forests were supposedly rich in species. Was the mbau forest an anomaly? What promoted mbau’s abundance? John, who entered the Wildlife Department, decided to concentrate on the game animals of the Mbuti. In the southern and central Ituri, the areas known by John and Turnbull, the Mbuti hunted with nets. Hunts were communal. Each family made and maintained its own net but a group of seven or more nets were needed for a good hunt. The animals were driven into the nets, most importantly six species of duiker or small forest antelope of the genus Cephalophus. They varied from the size of a mignon terrier to a Great Dane. John could take advantage of the net hunt to answer his questions: How were these species affected by hunting pressures? Could some withstand it better than others? All had a diet of fruit and seeds, so how did they manage to co-exist? Tshukiza looping his hunting net over understory branches. As our subjects narrowed down, our daughter Sarah grew bigger. A jolly and trusting baby, she thrived on the back of a bike whisked from office to apartment to garden. She peered with curious alertness over the rim of a backpack as we hiked long paths through Michigan’s woodlots, John and I side by side, talking. Sarah amused herself for hours propped up with pillows as one of us sat at a desk near by. She reached for one stuffed animal or plastic toy after another, cooing with accomplishment and wonder. Our dissertation projects received funding. We were off, this time the three of us. We bustled Sarah back and forth and packed our belongings: this to stay, this to go, this to stay. Stay where? My parents’ basement. Our list, “mid-wifery, mechanics….”, having served as compass to our studies for four years, was taken down and packed to stay in the United States. We three, would be in the forest, somewhere in northeastern Congo. This entry was written by Terese Hart, posted on 2014-06-17 at 4:01 am, filed under Ituri Story_memoire. Bookmark the permalink. Follow any comments here with the RSS feed for this post. Post a comment or leave a trackback: Trackback URL. Thrilled to read these memoirs, thanks for taking time to write them down. Emma. Thank you Emma, It gives me pleasure and a sense of understanding to write down these memories. All these years, and still some periods I remember with anxiety… good to write it all down. And it is very gratifying that you find the reading interesting. I just returned from my first trip to the central African forest region… I’m working with Kate Abernethy at Lopé for the next few years for my PhD. It was fantastic, but a lot more accessible than the adventures you describe! Hopefully I’ll make it to Congo sometime soon. I was unable to register for your news bullion. I’d appreciate if you could register me. Adam, I think that the problem has been cleared up. Smiles. Well,I wasn’t as off as I thought. Nyankunde was very much in your early days and I guess that’s what stayed with me.You sure have a good memory or are you using old letters home to help you?I thought you came from Buffalo.I lived there for four years while my husband was in med. school. from Zaire.I’ve used them and dairies I kept to write my own chronicle,as yet unfinishedi..I think the last 8 mos not yet included.